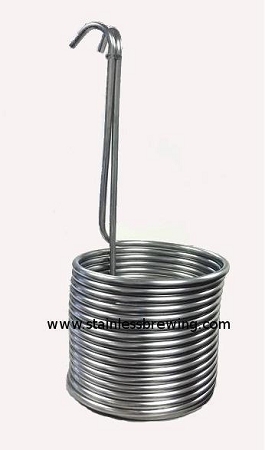 These immersion chillers are made up of 50ft 1/2"OD x .035 304/304L stainless steel tubing to a 12-1/2" diameter at an average height of 24". These are currently sold as the tubing itself with no additional hoses or fittings. Brass garden hose adapters are available for an additional cost.